In an effort to improve safety and relieve congestion, the New York State Department of Transportation (NYSDOT) is tackling the largest single-contract project in its history; the rehabilitation of the Alexander Hamilton Bridge. Carrying approximately 188,000 vehicles per day over the Harlem River in New York City, the Alexander Hamilton Bridge, a 1,485-foot, eight-lane passageway, connects the Trans-Manhattan Expressway in the Washington Heights section of Manhattan, and the Cross-Bronx Expressway, as part of Interstate 95. Rehabilitation includes replacing the existing bridge deck with a new concrete deck. The project also involves strengthening the steel arch span and steel support beams that make up the substructure of the bridge. To protect it from the weather, the steel will be painted and the support piers and foundation will be replaced or repaired. Furthermore, the bridge will be jacked up temporarily using steel structures to remove the existing support structure, and while the new concrete structures are formed. When finished, the bridge will be dropped back down. Raising the bridge approximately half an inch into the air during the jacking process will occur without interrupting any ongoing traffic on top of the bridge. "We are working on nearly all of the piers simultaneously, some are shored from the ground up, others are hanging systems from the temporary jacking steel, and still others are hybrids of shoring and hanging systems, " Michael Schermerhorn, Senior Account Manager, Doka USA, Ltd.
To form the new pier caps, concrete contractors Halmar International and China Construction JV opted to use Doka’s load-bearing Staxo 100 for supporting falsework on the main bridge portion. “On this project, we are rehabilitating the pier caps on the Alexander Hamilton Bridge and we needed a shoring system. We chose Doka’s Staxo 100 for several reasons: it’s easy to assemble, there are no loose parts and it has a built in ladder with tie off points in every frame, making it very safe,” said John Conlin, Concrete Superintendent for CCA Civil Halmar Interntational. A total of eight pier caps will be replaced or restored on the bridge. They are being formed from the ground up with Staxo 100, ranging from 20 feet to 90 feet in supporting height, 100 feet to 125 feet in pier cap length, and 7.5 feet to 12.5 feet of concrete depth. On the top of the Staxo 100, Doka designed custom preassembled tables to form the soffit for the pier caps. The other five pier caps will incorporate Staxo 100 towers with a custom suspended deck solution, because of the extreme height. 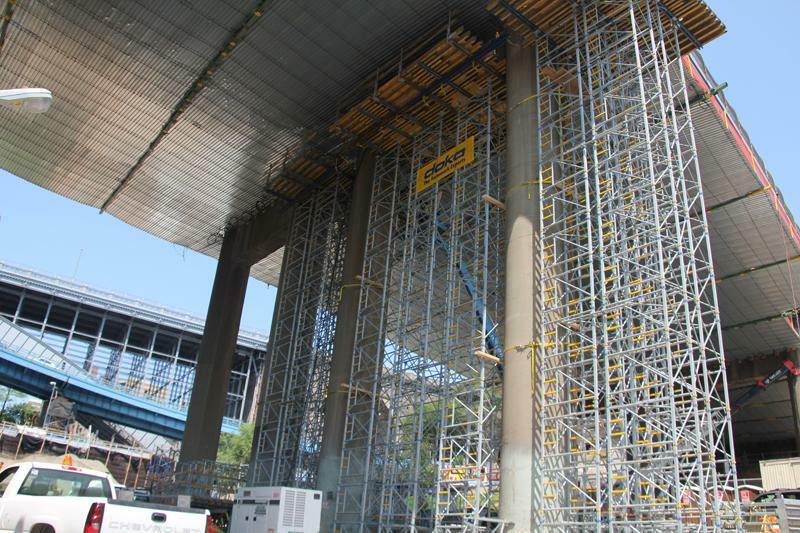 The suspended deck will be supported from a steel jacking system, which will relieve the load of the roadway from the columns. From this deck, smaller Staxo 100 towers will be fixed to support a form system similar to the previous three caps. "This major intersection of I-87 and I-95 with its many levels of ramps, along with the fact that we are also adjacent to the Metro North live tracks, really creates a logistical challenge for this site. Multiple deliveries of several Doka product lines have been crucial to the success of this project thus far," said Schermerhorn. The $407 million project is anticipated to finish in December 2013. The bridge facelift will benefit the entire northeast corridor. 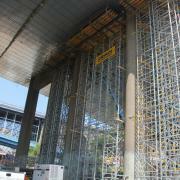 Thank you for your interest - Staxo 100 Raises Expectations During New York’s Largest Bridge Renovation Project. Thank you very much for your interest - Staxo 100 Raises Expectations During New York’s Largest Bridge Renovation Project.